Changing the direction of your bangs is not as simple as just brushing them to another side. Over time, your hair gets used to the direction it is styled in every day. 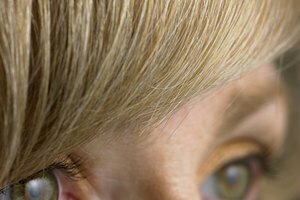 While changing the direction of your bangs is certainly doable, it does take some persistence and patience to train your hair to lay the way you want. A few styling products and a few days are all you need to change your part and give your look a lift. Wash your hair thoroughly to remove any styling product buildup. Towel dry most of the moisture out of your hair. Use a fine tooth comb to brush your bangs to the front and straight down. Use the pick end of the comb to create a small part at the hairline on the opposite side from your usual style. Brush the bangs away from your new part. Apply a small amount of gel or mousse to the roots of your bangs and comb it through, flattening the bangs as much as you can. Place the pointed nozzle tip accessory on your hair dryer and direct a low flow of warm air to your new part. Use your fingers to brush your bangs in the direction you want them to go as you dry them. Finish drying your bangs before concentrating on the rest of your hair. 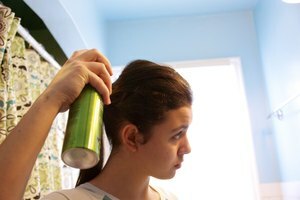 Use flexible hold hairspray to tame any fly-aways and to hold your new style. Within a few days, your bangs should naturally fall in the new direction.